India's Supreme Court has said that a prominent Hindu temple in the southern state of Kerala has no "constitutional basis" to ban the entry of women. 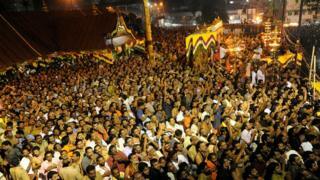 The Sabarimala temple bars all women in the age group of 10 to 50 from entering the shrine. Hinduism regards menstruating women as unclean and many temples impose restrictions on women's entry. In November, a group of women students started a campaign to protest against the practice. On Monday, the court asked the state government and Sabarimala temple officials to respond to its notices about the ban. The court was hearing a petition, seeking to overturn the ban imposed by the temple. The judges said they would hear the case on 8 February. In November, the Sabarimala temple chief told reporters that he would allow women to enter the shrine only after a machine was invented to detect if they were "pure" - meaning that they weren't menstruating. "A time will come when people will ask if all women should be disallowed from entering the temple throughout the year," Prayar Gopalakrishnan said. "These days there are machines that can scan bodies and check for weapons. There will be a day when a machine is invented to scan if it is the 'right time' for a woman to enter the temple. When that machine is invented, we will talk about letting women inside," he added. Mr Gopalakrishnan's comments outraged women who launched a #HappyToBleed campaign on Facebook to protest against the "sexist statement". Several young women posted their pictures holding placards - some made up of sanitary napkins and tampons - with the slogan "Happy To Bleed" on Facebook. Nikita Azad, who started the campaign, told the BBC there was no "right time" to go into a temple and that women should have the right to go "wherever they want to and whenever they want to".